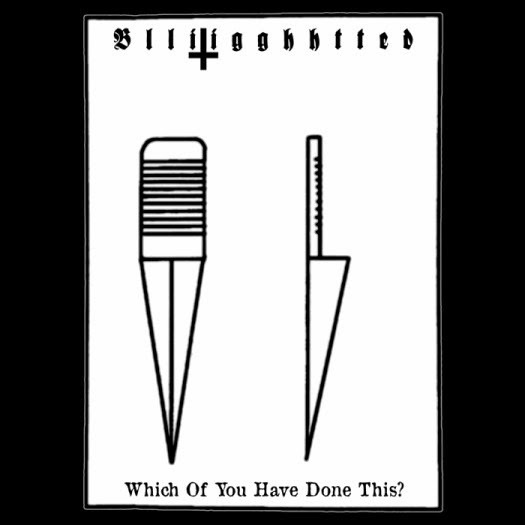 Metal Bandcamp: Blliigghhtted - Which of You Have Done This?? Which Of You Have Done This? is a half-hour of some of the most chilling ambient blackened noise you may ever hear consisting of one track titled “The Lords”. Blliigghhtted as an entity comprises three members, Yayla's Emir Toğrul (guitars/vocals), Viranesir's Ruhanathanas (conduction/vocals/lyrics) and Destroyer of History's Merdümgiriz (synths/vocals). “The Lords” as described by the collective is a “psychodrama for exploring the history and philosophy of dark spirituality through correlations and juxtapositions of tradition and degeneration in essence and form.” Heady stuff. Even if you choose not to delve into those lyrical realms, WOYHDT? still offers plenty to penetrate and corrupt the mind. Droning guitar and organ usher in ritualistic spoken voices of varying intensity. The voices range from possessed incantations through ghostly vocal emanations, deepening the sense of unease brought on by the instrumentation. Hypnotic percussion provides a slow and steady pulse while the guitars, synths and vocals tumble through the ether in a chaotic haze. It's desolate and introspective as the outpouring of ultimate sorrow separates the listener from the warmth and light. Vocal demons inflict a myriad of feelings from all sides, none bright, as the eerie, psychedelic synths enhance the air of mystery and ancient evil and the free-form guitars scrape away at mental barriers with arachnid-like terror and excise any hope for escape. The sense of dread deepens as the members continue to layer their convocations through a mind-numbing fog. They overlap and distort perception like infinite ripples in a pool of never-congealing blood. It's instinctually unsettling yet oddly calming as if the realization has been made that it's only just a nightmare. Or death. And no amount of worry will end the desperation. WOYHDT? is a captivating and entrancing release of inspired yet twisted vision from these strange and esoteric artists guaranteed to break your nerves and bend your will and cast you into their slow-boiling pit of madness and despair. Emir and his cohorts are brilliant. Dark ecstasy and hell infernal! Yeah, they always seem to produce interesting stuff. And those hand painted tshirts are neat. Thanks so much Travis, your music rules as well.